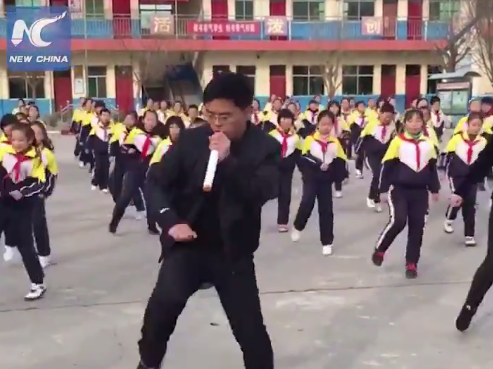 WATCH: In China, School Principal Leads Students In Dancing To A New Beat At first the teachers were skeptical, but after two weeks they joined in "because the music is full of energy ... it really gets the happiness flowing," Zhang Pengfei told a local newspaper. The image of a Chinese schoolyard full of students doing calisthenics isn't new. But these moves definitely are. Dressed in a sleek black-on-black ensemble, school principal Zhang Pengfei leads his students in a synchronized routine that would turn heads in any dance club. In matching tracksuits, the kids at Xi Guan Primary School in Shanxi province shuffle their feet, pump their arms, and do the Charleston and the Running Man. Do yourself a favor and watch both videos here immediately. Dancing school principal becomes viral sensation. Their moves are known as a shuffle dance or the Melbourne Shuffle. Daily calisthenics are required each morning for all students in China's primary and middle schools, according to China's Xinhua state news agency. Government inspectors can even show up at schools unannounced to ensure the exercises are being done, the South China Morning Post reports. Zhang told local newspaper Southern Metropolis Daily that he wanted to introduce the shuffle dance because the students and teachers were completely uninterested in the regular version of the morning exercises, known as radio calisthenics, the Post reports. At first many of the teachers were skeptical, but after two weeks they joined in "because the music is full of energy ... it really gets the happiness flowing," Zhang said. On Chinese message boards, some worried that Zhang could lose his job for abandoning the government-prescribed regimen, the Post reports. "The official exercises are based on science – they must be good for the students or the government would not have enforced it for so long," one hotel manager told the newspaper. Also from China, here is another mesmerizing synchronized exercise video, this one from 2017, in which students in the city of Dalian mix gymnastics-style stretching with basketball dribbling. If you're anything like us, you suddenly feel the need to learn to Melbourne Shuffle. Here's a helpful tutorial that breaks down all the steps, so you can try to dance as well as a primary school student.